The University of Western Australia (UWA) pertains to be one of the strongest research intensive universities in Australia. It successfully holds its place in the Group of Eight (Go8) as one of Australia’s eight leading research universities. Go8 universities are consistently the highest ranked Australian universities, with all Go8 member universities ranked in the top 100 institutions worldwide in the Academic Ranking of World Universities. The university holds prowess in several fields of research including; Biosciences, Engineering, Business, and Historical Studies. The university is also home to two Nobel laureates; Robin Warren and Berry Marshall, the latter having conducted his award winning research on bacteria in the university itself, making it one of the most prospective universities to gain a higher education. UWA is also consistently ranked among the top 20 internationalised universities, making it a holistic, culturally-inclusive place for any Sri Lankan student aspiring to study abroad. Notable international alumni include Professor Charitha Pattiaratchi, born in Sri Lanka, with a deep-gauged knowledge and interest in coastal research of the Indian Ocean. His paper accurately predicting the debris of the lost MH-370 flight was a monument in his research and in aiding the search for the lost plane. Dr. Pattiaratchi currently holds post as Professor of Coastal Oceanography at UWA and has released over 300 articles in his field. In 2015, UWA partnered with three universities in Sri Lanka – the University of Moratuwa, the University of Jaffna and the University of Sri Jayewardenepura for a three-year project on sustainability management. The project is coordinated by Sri Lankan-based, DFAT Australian Awards Leadership scholar Randika Jayasinghe who initiated the initial research for her PHD. The project’s key aims are to create a low-cost waste plastic composite processing and resource facility at the University of Moratuwa and a satellite facility at the University of Jaffna. The Astronomy and Astrophysics group belonging to the International Centre for Radio Astronomy Research is a joint venture between Curtin University and UWA. The group focuses on the development and capabilities of radio telescopes including the Square Kilometre Array (SKA) project which is to be the world’s largest radio telescope capable of seeing the early stages of the formation of galaxies, stars and planets. Projects such as these provide ample research opportunities in data science, analytics, and astrophysics to name a few. 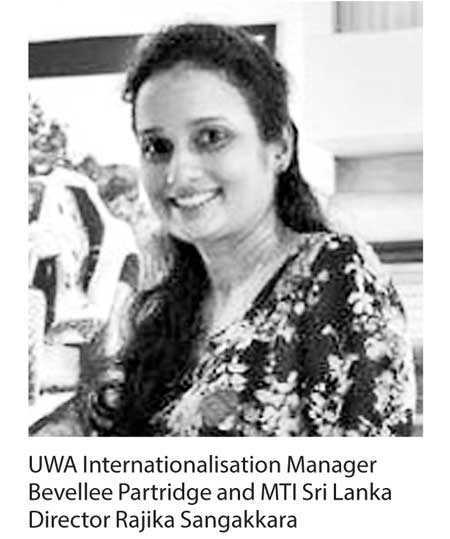 “UWA is the ideal higher education destination for Sri Lankan students with an interest and passion for research. Undergraduate courses, specialised Masters, MBAs, Doctoral, Executive Education and cutting-edge research are now accessible to students through MTI’s partnering with the World Top 100 University,” said MTI CEO Hilmy Cader.